October has been a slow month here at Variance Hammer for a number of reasons – most of them life-related administrative tasks and travel. Several new posts are in the works, but in the meantime, Lifeform has reached out to me and said that they’ve made some serious revisions to their Assault Dice app, and always being one to encourage iterative development, I thought it was worth revisiting. Great review and thanks for the ups and downs. We just released a major overhaul of the dice engine which now does, in fact, let you run with some very massive dice counts — up to 200 on an iPhone 5S or better. Additionally, any device running iOS 8.1 or better can run the app — whee! On the note regarding alternate target numbers for a single die roll, the concept had been to sort dice of a given target number onto individual dice panes. Reading your article, I can see that’s not as ideal a solution as we thought it might have been. I’ll definitely add that to the upcoming queue for our next update. Re-roll of selected dice are absolutely in there now as well as massive overhaul of the selection system. If you touch and hold on the enumerator along the time you can select all of a given number, or if selected, unselect them. Touching and holding on an unselected die will select all dice and vice versa to unselect. You can use any combination of these to pick and choose which dice you wish to re-roll, remove, or add to your dice cup. Additionally, we’ve added a rate of fire to the dice cup and the add dice button to enable rapid population of the dice pane — need 5 dice at a pop? 10? if you want more just hold the button down and it’ll spit dice out until you hit the dice cap for the pane. For the time being, we’ve added some (currently hard to read) UI along the edging to tell you what dice pane you’re on and how many you’ve got left as well as what your current dice cap is set to. You remove the dice cap from the app settings as well. When removed each pane can handle up to 200 dice. Finally, plans for the next update include aspect ratio expansion for tablets, faction sets for non-aquila die types, hit and wound tables and now I’m definitely planning for how to manage variable target numbers. Again, thanks for the review. Would love to hear you feedback on the updates! A fairly even-handed comment for what was, to be honest, a fairly negative review. How has the revision fared? I don’t have a device that could run iOS 8.1 but couldn’t run the app originally, so I can’t comment on the increased compatibility. But the increased number of dice? That I can attest to. The developers say that it can support up to 200, but my version of the app set a soft cap of 160 for best performance on my iPad Air 2. I promptly disabled this to get all 200 dice rolling, and this works reasonably well. 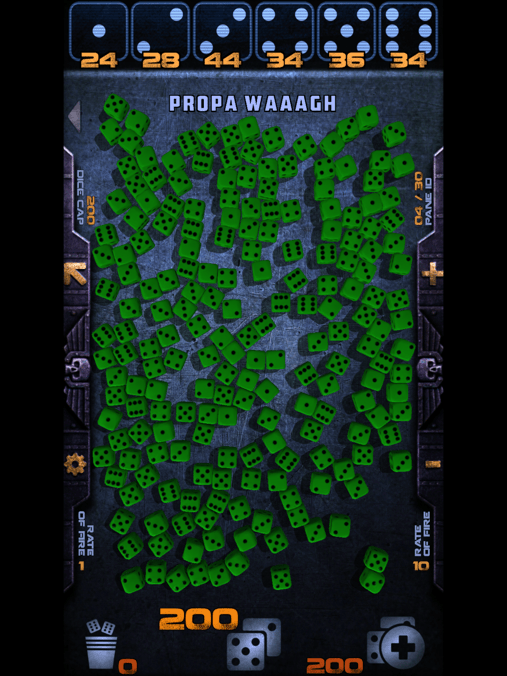 Ironically, the biggest problem I’ve had at this number of dice is that the app doesn’t record a die roll until they all settle flat on a surface – the dice rolling animation is what determines the stop. With 200 dice it’s a crowded field, so some bounce around a lot. This is, to my mind, the biggest reason to consider Assault Dice, and with the 10x increase in the number of dice you can roll, you genuinely save some time for those truly massive units over rolling them physically, in a way you won’t with 10 or 12 dice. The problem now is actually reading the totals and doing some double-digit addition in your head. The easiest way around this, for me, is to tap the target number, the app will return all the failed dice to the “dice cup”, and the middle figure on the screen will show how many dice are left on the field, in this case, the number of successes. Rerolling is also easier. Simple twin-linking can be handled by putting all the misses back in the “cup” and then taking them back out, which results in a re-roll. Selecting individual dice, or a whole group by holding down the target number, allows more specific re-rolls (like all 1’s or the like). There’s still a number of things that preclude this from being my “go-to” solution for dice rolling. The first, and most obvious, is the loss of actual dice, which is something a lot of people care about. 40K is a very tactile game, and the dice are a part of that. It’s also going to be tricky to go fully digital if you have to flip between an electronic codex and an electronic dice roller, and while it doesn’t seem that Assault Dice is too hard on an iPad’s battery with some short and very casual tests, I might worry about it for a long day of tournament or Apocalypse play. It also remains poorly suited for multiple target numbers in the same pane – according to the devs, the original intent was for multiple target numbers to be spread over multiple panes, but to me the logical unit of organization for a pane is, well, a single unit, which may or may not have differing target numbers. Having to switch over multiple panes would be slower than just rolling, and that’s a problem. Finally, it’s occurred to me that the scatter dice roll has to happen with your device on the table, as rotating the phone will rotate the directional indicator, negating the benefit in the first place. If you’re using an iPad, that’s a very large footprint. Do I still think that Assault Dice is a bit of a solution looking for a problem? Yes. But it’s a better solution, and it does help address the one time when dice become really painful, which is when using absolutely bucketloads of dice for a single attack. If I had a unit that did that that I fielded on a regular basis, it might be worth the fairly modest cost just to streamline that aspect of the game, and go back to physical dice for most rolls. And the developer’s commitment to iterative improvement is definitely impressive. Overall Rating: 5/10. Niche utility, but not I think a solution for everyday gaming.